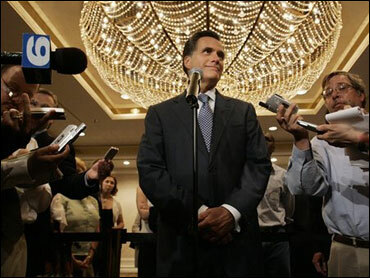 This column was written by Mitt Romney, a former governor of Massachusetts and a Republican presidential candidate. Late last week, two developments involving stem-cell research offered a sharp contrast between the great strengths of American biomedical science and the terrible weakness of Washington politics. First, on Wednesday, we learned that researchers in Massachusetts, building on prior accomplishments by colleagues in Japan, had managed to transform regular skin cells into the equivalent of embryonic stem cells in mice. Their work points to a way to produce cells with the qualities scientists value about embryonic stem cells — but without the need to create, harm, or destroy human embryos, and therefore without ethical or political controversy. But then, on Thursday, the Congress passed a bill that would for the first time use taxpayer dollars to encourage the destruction of embryos for research. Just as it is becoming increasingly clear that scientific ingenuity could offer a way around the divisive controversies of the stem-cell debate, congressional Democrats are working to stoke those very controversies. They have opted to exacerbate what they see as a political debate that works in their favor, rather than encourage a scientific solution that would work in America's favor. When I was governor of Massachusetts, my state wrestled with the stem-cell debate and I confronted many of the same issues now being debated in Washington. I carefully listened to all sides, and came to reject the idea that the exploration of stem cells had to come into conflict with America's commitment to the dignity of human life. Some advocates told me that only the creation of human embryos for purposes of experimentation, otherwise known as cloning, could help them better understand and perhaps someday treat a series of dreaded diseases. But they ignored the importance of protecting human equality, dignity, and life. Opposing advocates told me that the pluripotency of stem cells — their ability to become a very wide variety of different cell types — would not be of great therapeutic value, and that other sources of tissues and cells could serve the same purpose. But they ignored the unique role pluripotent cells could play in basic science. Couldn't the strongest part of each side's argument — the utility of pluripotent cells on the one hand and the importance of protecting human life on the other — be brought together? I studied the issue for many months, and entered into conversation with experts from across the nation who were looking for consensus solutions, like Stanford's Dr. William Hurlbut. In the end, I became persuaded that the stem-cell debate was grounded in a false premise, and that the way through it was around it: by the use of scientific techniques that could produce the equivalent of embryonic stem cells but without cloning, creating, harming, or destroying developing human lives. A number of such techniques have begun to emerge in recent years, and as last week's exciting scientific publications showed, some of the world's best stem-cell scientists are hard at work bringing them to fruition. Moreover, two of these techniques, Altered Nuclear Transfer and Direct Reprogramming could produce patient-specific stem-cell lines for the study of diseases. Our government should encourage and support these scientific developments rather than undermining the effort to find a solution. Finding cures to diseases using methods that uphold ethical principles and sustain social consensus should be the objective of America's approach to stem-cell research. Rather than looking for such solutions, however, the Democrats in Congress have decided to turn back the clock and pass a bill that only sets research and ethics at odds, a bill they know will be vetoed by President Bush. This familiar Washington approach to controversial issues is just wrong. On matters of such significance, we should try to bring the country together, not further divide it. Support for ethical biomedical research should be part of our collective identity as a noble society. Instead of turning the quest for cures into a partisan battle, Congress should embrace the exciting emerging lines of research that could meet the goals of all sides in the stem-cell debate. A bill to support just such a positive approach to stem cell research passed the Senate in April by a whopping margin of 70 to 28. But the House Democratic leadership, choosing politics over the prospect of consensus on science, appears to be unwilling even to allow a vote on that hopeful legislation. It is time to move beyond typical Washington politics, and offer support for stem-cell research techniques that bring science and ethics together to promote life, protect life, and save lives.